Has it happens, New Holland are up there with John Deere as one of the most sort after officially licensed toys on the market. And as you'd expect, its mostly focused around their blue tractors. 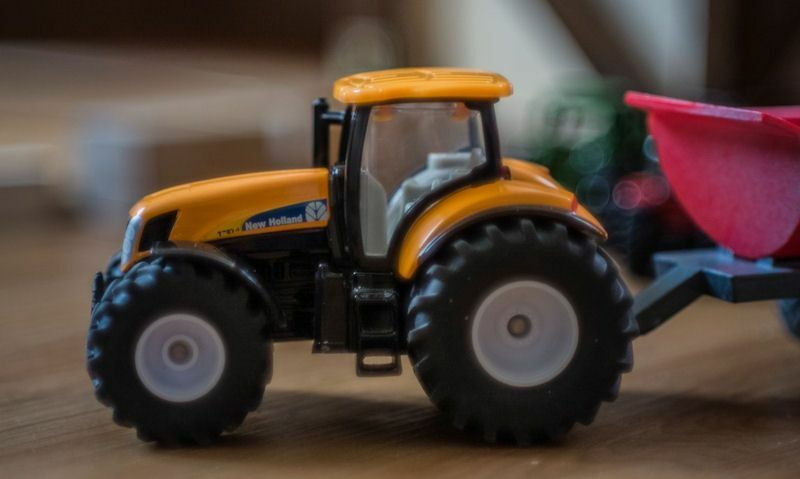 Among those currently available are replica scale die-cast tractors, ride on pedal toys with puzzles and New Holland themed gifts for child's play. Officially licensed to quality, up market toy brands, they all bare the New Holland logo and always are finished in blue or... yellow, weired hey. When we think of New Holland, naturally their tractor series comes to mind, but that's not all they do as they develop farm machinery and vehicles too. So again this is all replicated in the replica toys from Britains, Siku or Bruder, and this is most noticeable in replica toy telehandlers and combine harvesters. You're spoilt for choice with New Holland toy tractors, in fact there must be dozens of them in all shapes and sizes, but three ranges stand out as the best. Take Britains farm toys, they're available in both 1:32 scale and 1:16 scale respectively - in die-cast metal or durable plastic. 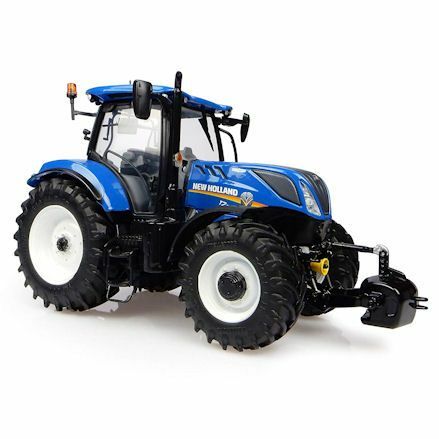 The Britains 1:32 scale tractor series are packed with New Holland die-cast replica's with all the latest models. They can be paired with a mix of trailers and implements but are suited to matching New Holland farm toys. Likewise, take a look at Britains Big Farm toys with New Holland there too, in a big 1:16 scale with lots of functional parts - plus engine noises and sounds. Contrast to Bruder 1:16 New Holland tractors, well they scale up the same, in our opinion make the best tractors; hard wearing, steering, opening doors and really tough. That takes us to Siku, with them you can get hold of a New Holland farm toy (not just tractors) in 1:87, 1:72, and 1:32 scale. Apart from New Holland toy tractors, you can also look to support farm vehicles that can be paired with the tractor to carry out jobs on the farm. Not in their blue, but there are yellow New Holland replica combine harvesters in largely 1:32 scale, from Britains in die-cast metal. You can expect a rotating cutting head and rolling steerable wheels from the rear. Then finally you can get hold of New Holland toy telehandlers (in blue again this time) at the moment, exclusively in the Britains 1:32 series. When going for 1:32 scale toys, New Holland are vastly available from Britains, with Siku supplying a number too. Incredibly, New Holland toys extend to ride-on pedal tractors with the second biggest range after John Deere. Well these beautifully built pedal tractors struggle to replicate the real thing due to weight and size restraints, these ride-on tractors are still a winner. Expect to find the New Holland pedal tractor finished in a perfect blue, black trim with silver alloy wheels, with maybe a little yellow. The two major players in producing these delightful ride-on tractors are Falk and Rolly. The brands produce their toys with all the accessories required to extend farm play in the garden, sold as standalone or with the option to add-on later. They have real steering, possibly a horn, a front loader for picking up sand, well you can dump it all in to a matching NH trailer hitched to the back of the tractor. Made to be as lightweight as possible, these bulky outdoor toys will sure last the test of time and do require maintenance like anything you ride outdoors. Well we focused on ride on tractors for older kids, also look at New Holland sit and scoot tractors for toddlers, starting at 24 months. New Holland farm models made for collectors are usually made with intricate detail with features more fragile and delicate, therefore would not be suitable for child's play. 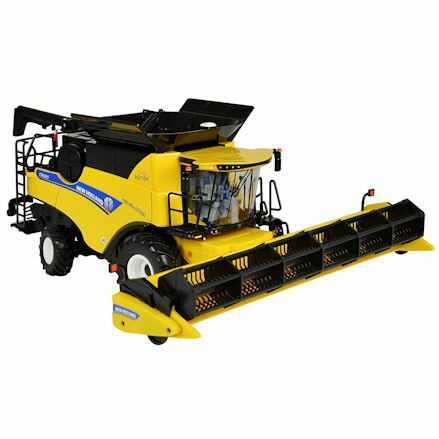 New Holland replica farm models include tractors, farm vehicles with a whole series of model farm implements to complement one another. They're then displayed in a clear box or cabinet for you to admire, and not touch. 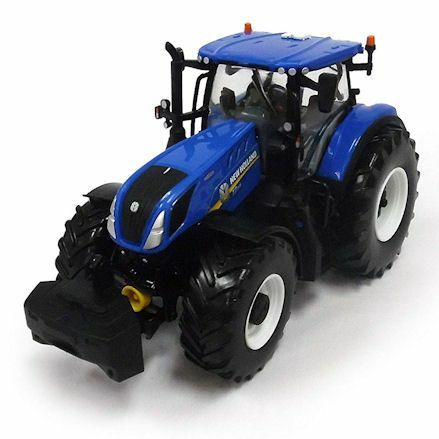 One primary producer of New Holland model tractors are Universal Hobbies, a specialist farm model manufacturers producing replica models from all major manufacturers. Well Universal Hobbies have a long line of NH models available, you'll be sure to find model tractors from the full series carrying a full line of attachments. Additional, model brands producing a line of New Holland models similar to Universal Hobbies include ROS and Motorart. Get the young farmer interested in the New Holland brand or find a special gift idea for a New Holland fan in your family with a present baring the New Holland logo. 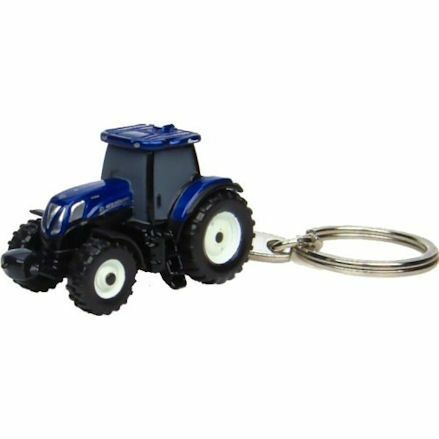 This includes a replica New Holland tractor keyring that can be turned into a toy tractor with related farm implements and vehicles. Like any major brand there is sure to be official merchandise presenting the company and these items can come in all forms. When we talk about New Holland merchandise we're really talking about items suitable for children, used for play; such as puzzles and games also. Don't make the mistake of seeking out New Holland toys in blue mind you. This is something we've done in the past and find many people do it still. In fact New Holland toys come in a bright yellow finish. 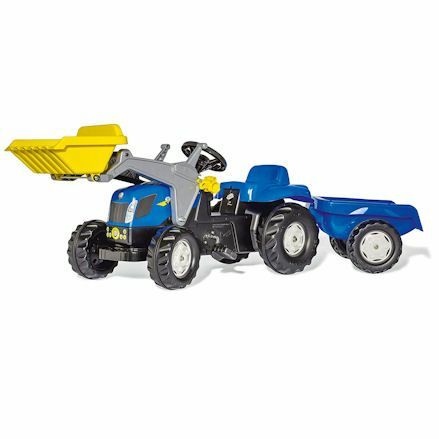 So to clarify, New Holland toys are mostly in blue with a smaller range (including the tractor in the featured picture above) coming in yellow. And well there are a few toy tractors in yellow - to represent their real life machines - the combine harvesters and hay balers can be found in yellow. So there you have it, we've laid out just what sort of New Holland toys are available to the young ones, and as explained, there's more toy tractors you'd ever possibly see. Though we have given you our personal take on Britains, Bruder and Siku making the best tractor toys and similar farm implements. Children's tractor play also extends to ride on pedal tractors, sit and scoot and even battery powered models, all made to look like a New Holland tractor. All toys are mostly focused on children 3 years and up, but look carefully as there are New Holland toys for toddlers.